Astoria is for explorers! As the oldest American settlement west of the Rockies, Astoria offers a rich history for your exploration. It was first visited by Captain Robert Gray in 1792, by the Lewis & Clark Corps of Discovery in 1805, then adventuresome pioneers by the thousands. Now its your turn to experience the excitement of exploring Astoria. Within a 20 mile radius, one can see dozens of exciting attractions including Fort Stevens State Park, Fort Astoria, Heritage Center Museum, Flavel House Museum, Uppertown Fire Fighters Museum, Astoria Column, and the Columbia River Maritime Museum, home to one of the nation's finest displays of model ships and nautical artifacts. 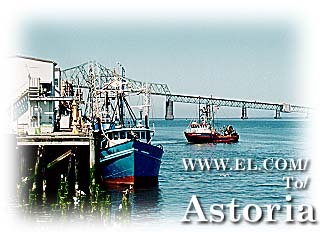 Astoria offers other fun discoveries, such as historic Victorian homes, the beautiful 4.1 mile long Astoria Bridge, cruise ships, and fishing charters offering the thrill of landing your own salmon, sturgeon, or crab. A walk to explore the city's waterfront should include stops at the 6th Street Viewing Dock, the 14th Street Riverpark with its interpretive panels of river activity, and the 17th Street Pier where there's a chance to tour visiting ships. Ride the 1913 trolley that runs beside the Riverwalk and discover the bustling business district with its many unique shops and galleries. For the kids, there's nothing like a trip to the Uppertown Firefighters Museum at 30th and Marine Drive. It is full of fire fighting memorabilia from 1877 to 1963. The collection includes motorized, hand-pulled and horse-drawn fire engines, as well as a large photographic collection of some of Astoria's spectacular fires. The Astoria Children's Museum is located on the second floor, and offers interactive and educational play experiences for children. Come to Astoria - and experience the thrill of modern day exploration. In June, Danes, Finns, Icelanders, Norwegians and Swedes join together to honor their heritage and celebrate the return of sunshine and warmth. Festivities include Nordic dishes, costumes, parades, music, princesses, trolls, crafts, folk dancing, and hex burning. Climb the 125 foot high Astoria Column, patterned after Trajan's Column in Rome by architect Electus Ritchfield. The column was dedicated in 1926. Once on top, you will have a breathtaking view of the Pacific Ocean, Columbia River, and Saddle Mountain and the Clatsop Plain. Or, enjoy the mural created by Italian artist Atillio Pusterla that spirals up the outside of the column. The scenes and figures of the frieze depict the westward expansion of the settlers and Oregon's early history. The column was restored in 1995.